1837: Gyldén, C.W. Map of Helsinki. Copyright for digital version University of Jyväskylä. 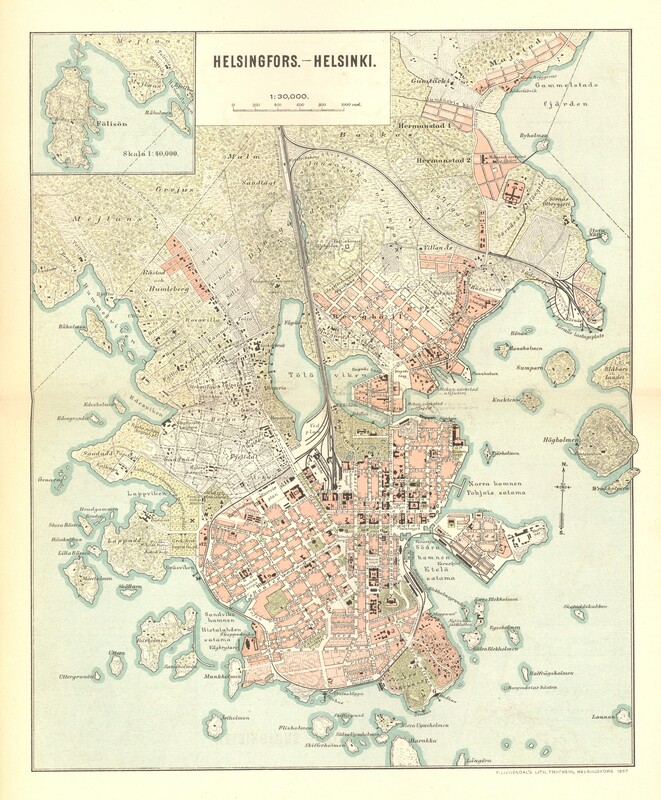 1897: Suomen Matkailija-Yhdistys: Suomi kartasto, Map of Helsinki. Copyright for digital version Pauli Kruhse / Histdoc.net. 1943: Aerial photos 1943, photographed 4 May ja 9 May 1943. Original source: Helsinki Region Infoshare. Compiled by C.W. Gyldén. He was the over director of National Land Survey of Finland. In addition to this, he owned to whole Lauttasaari. Interesting in this map are the tolls along the roads to the north "Tavast tull" and north-west "Esbo tull". You can also see the long and short bridges leading to Siltasaari, of which nowadays only the long one, "Pitkäsilta" is left. The railway to city centre is missing, in the place of the current central railway station there is the Glo (Kluuvi) bay. From "Suomi-Kartasto", a map book over Finland, collected by Suomen Matkailija-Yhdistys. Interesting details in the map include planned road network in Töölö and "Linjat" in Hakaniemi that extend up to "Kuudes linja". Kaisaniemenkatu does not exist yet. See photos over Helsinki from the year before. The aerial photos were taken before the massive bombings in 1944. The quality of images is very good. One interesting detail is the bath house in Kaivopuisto, which still exists in 1944. Lauttasaari and Kulosaari are still mostly unbuilt. This is a vision of alternative Helsinki which was never built. The M1 highway cuts through Punavuori and connects Lahdenväylä with Länsiväylä. The M1 highway is just one of the planned highways surrounding Helsinki. These would have transformed Helsinki to something akin to a northern Los Angeles.